The late Mario Benedetti's work was often ranked with "such esteemed Latin American writers as Gabriel García Márquez, Carlos Fuentes and Julio Cortázar" (The Washington Post) and his novel The Truce has sold millions of copies around the world. His extraordinary novel Springtime in a Broken Mirror revolves around Santiago, a political prisoner in Uruguay, who was jailed after a brutal military coup that saw many of his comrades flee elsewhere. Santiago, feeling trapped, can do nothing but write letters to his family and try to stay sane. Far away, his nine-year-old daughter Beatrice wonders at the marvels of 1970s Buenos Aires, but her grandpa and mother--Santiago's beautiful, careworn wife, Graciela--struggle to adjust to a life in exile. Published now for the first time in English, Springtime in a Broken Mirror tells with tenderness and fury of the indelible imprint politics leaves on individual lives. Generous and unflinching, it asks whether the broken bonds of family and history can ever truly be mended. Written by one of the masters of the Latin American novel, this is the story of a fractured continent, chronicled through the lives of a single family. A "rich, heartbreaking novel. . . . Benedetti's tender yet unflinching portrait of a family in the crushing straits of history is a welcome addition to the small (and hopefully growing) catalogue of his work that has been translated into English." 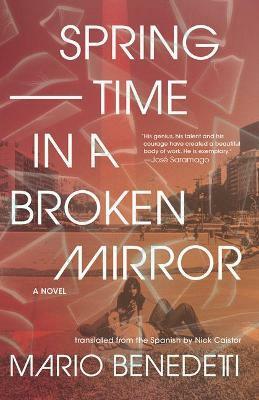 "This powerful novel evokes the works of Gabriel García Márquez." "Mario Benedetti was full of joy . . . he wrote it all, and his genius, his talent, and his courage have created a beautiful body of work. He is exemplary." "This is a masterful novel, but for English-speaking readers it is also an overdue one. More Benedetti can't come soon enough, I say." "This is the perfect way to enter the rich and luminous world of Mario Benedetti, one of the great Latin American writers of the past century. He was a prolific poet, novelist, journalist, and master of the short story form, and this sad and beautiful novel brings all of his many talents into focus. Despite the note of alienation that inevitably haunts this novel, Springtime in a Broken Mirror left me in a mood of exultation. The human spirit presses through the cracks in history here, and this novel feels wonderfully fresh, its hero unbowed in the face of exile and bereavement." "Springtime in a Broken Mirror is written like a psalm--a beautiful meditation on exile, dictatorships and the lives elevated and isolated by the struggle against both." "One of Latin America's most respected, popular and prolific writers, who excelled as a novelist, poet, playwright and essayist while immersing himself in the region's political struggles." "In Latin America and Spain, [Benedetti] is remembered above all as a poet who sought to speak of love and political commitment as directly and passionately as possible. In one of his last poems he gave the instructions: 'When I'm buried / don't forget to put a Biro in my coffin.'" Mario Benedetti (1920-2009) was a Uruguayan journalist, novelist, and poet. He is considered one of the most important twentieth-century Latin American writers. He won the Queen Sofia Ibero-American Poetry Award in 1999, and the José Martí prize in 2001. He was the author of many works of poetry, essays, drama, and fiction.